I am playing along with Cindy's Eye Spy meme each Sunday. This week the wonderfully talented Sharon from Handmaiden has suggested that we show something delicious. So, here is my something delicious. 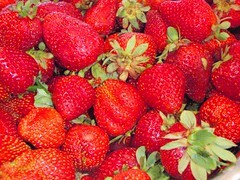 This huge box of over-ripe, pungent, sweet-smelling strawberries were purchased from my local farmers' market this morning. They have a intense flavour and are destined for homemade jam. The market produce always seems so much more delicious - fragrant, colourful and flavourful - than its store-bought equivalent. But mother nature (and sometimes fellow man) can be cruel to our rural producers. Over the last two days large scale bushfires (some deliberately lit) have torn through country Victoria. Unimaginable things have happened to property, stock, livelihoods and, more importantly, lives. Many people have died or been injured and many more are homeless. And there at the market this morning, I noticed some stall spaces marked out, but vacant. I can but wonder what had happened to those people who didn't make it this morning. The Red Cross has launched an emergency appeal to help people affected by the fires. If you could spare a little something, you can make a secure online donation over here. Very sad loss. I think we will only see the true devastation in a few days time - when the fires can be controlled. Oh gosh. Let's hope their produce was just damaged in the heat the other week. It's better than the alternatives isn't it. It's all so horrible. I have been keeeping updated on the devastation in vic. all the news channels still covering it.